Radio coverage has greatly expanded to where weekly shows are common and in-depth discussions of current play and the history of the game are listened to intently. 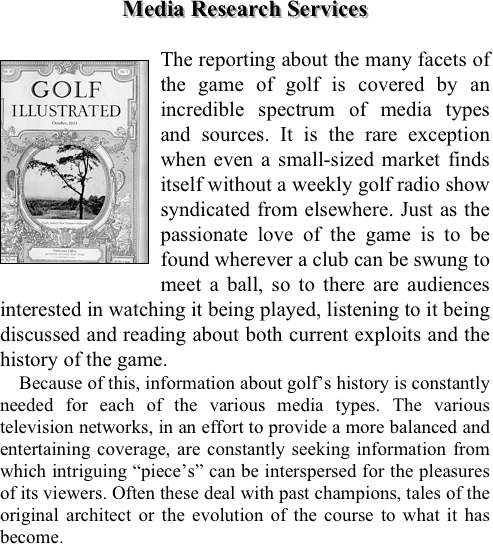 Golf Journals and newspapers, though they tend to cover events in different manners based upon when they publish, still they have a similar need for a great deal of background information. •Long-term research in preparation for major championships and the stories they generate. •Short-term research in preparation for any tournament regardless of status (major, PGA Tour event, etc…). •Our databases and sources allow for accurate and fast fact-checking done by those intimately familiar with both the game and its history, even where it needs to be done at the last-minute. •Locating of documents, drawings, photographs and other items that may be used to enhance either broadcast or written reports. •Research for authors to aid them in their writing projects. Today’s economic reality demands innovative answers to meet budgetary restrictions. Golden Age Research offers you a trustworthy, dependable and accurate that you can count on for any project you may have.